The first big tournament of the year is upon us and there is no Tiger Woods, or Phil Mickelson. The two biggest drawcards in golf are on the sidelines for personal reasons, and that is a shame when you have such a talented field of 64 players. Geoff Ogilvy plays his tee shot at the 16th hole in the final round of his victorious Dove Mountain campaign in March 2009. Some of the stories making headlines aside from the absent "big two" make for great reading. Steve Stricker is just shy of his 43rd birthday and the new world number two ahead of Mickelson. Rory McIlroy is a huge hit among the fans. The Molinari brothers from Italy are making their World Golf Championship debut. The Japanese press corps following Ryo Ishikawa makes you wonder whether Elvis just walked in the building, and of course it helps when he likes to dress the way he does. There is plenty more to watch this week as well, but let’s get back to Tiger for just a moment because he is to golf what Elvis was to music. I did manage to chat with his former coach Butch Harmon, who let fly the rather bold prediction that the world number one won’t be back on the scene this year. “People think I am crazy for saying it, but I really think we won’t see him until next year,” he explained. “Inside the ropes, Tiger is a different person. He’s so competitive that it really is intimidating. Off the course he is a different person, and I should know because I spent so much time with the kid. Butch’s last point came with the explanation that everything around Tiger was manufactured and controlled, especially with media interviews. “Now all bets are off and he knows he won’t be given any slack anymore. That’s what he has to come back to - not easy,” he said. Enough about Tiger for now. The first of five days of terrific match play golf got underway Wednesday with the Aussie Geoff Ogilvy defending the title. He has an extra spring in his step after becoming a father for the third time just a few days ago and it’s only his third tournament this season. 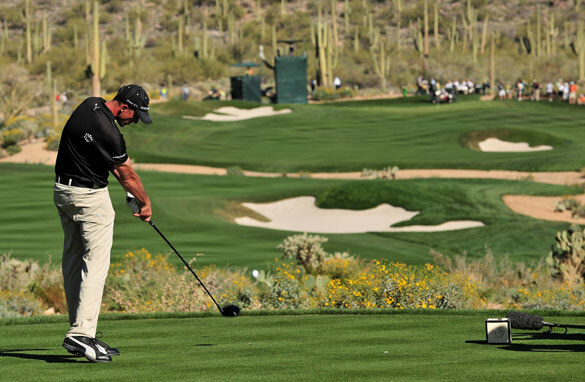 Picking a winner, though, at Dove Mountain is a real lottery. It’s a knockout competition that culminates with a 36-hole shootout on Sunday. Anything could happen. Tiger Woods should be suspended for five years by the PGA and receive a lifetime ban from all USGA events. Many other golfers have been suspended or banned under the umbrella justification of "Conduct unbecoming......." If their behavior merits these punishments then his should too. Jim Thorpe and John Daley have been suspended for conduct unbecoming a member of their organizations. If them why not Tiger Woods. Suspended for five years?? Get a grip. Fans paid him to PLAY GOLF and not to be husband of the year. Too bad we're more obssessed with the personal lives of celebrities than we are about poverty...the economy...real issues!! I suggest you judge yourself with the same intesity FIRST before you open your mouth to judge someone else.